Toledo is located in southwestern Lewis County along the Cowlitz River. This small city has less than 1,000 people and is mostly residential, retail, and a logging/farming area. 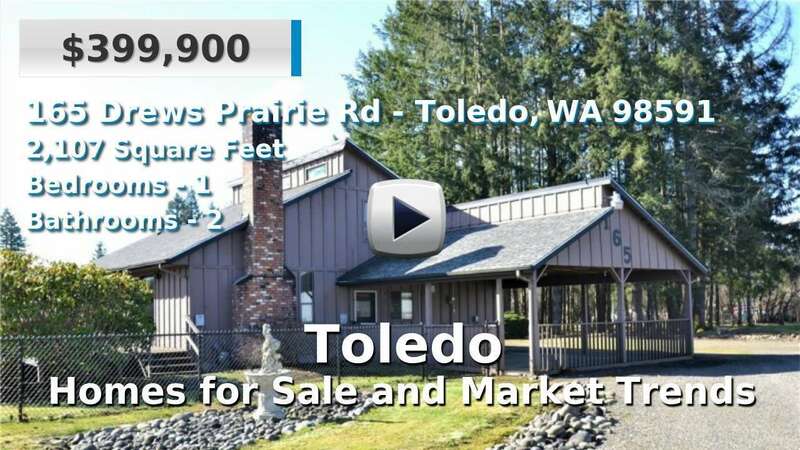 Though it is fairly rural, Toledo is located just off I-5 which makes the 20 mile commute north to Chehalis/Centralia or the 25 miles south to Longview very convenient. Homes for sale in the area are about average for the state, but many are on the waterfront or acreage. An annual 3-day festival known as Cheese Days celebrates the city's heritage as the home of the Cowlitz Valley Cheese Association, started in 1919. The celebration is a much-loved way for this small community to come together every year. Secluded level land! 19.85 Acres, just outside the city of Toledo, near the Toledo airport. Easy commute to I-5. 3 Beds | 1.5 Baths | 2088 sq. Ft.
3 Beds | 2.5 Baths | 1912 sq. Ft.
3 Beds | 2.75 Baths | 5800 sq. Ft.